If you're trying to find a large holiday for a special get together - may be you've got a birthday coming up; or an anniversary; or you just want to spend a few days with your friends, "Silverholme" could be the holiday home you've been looking for. Sleeping 18 people in 9 bedrooms, Silverholme is quite a stunning holiday cottage. This manor house is located down a private drive, which meanders through a mature wood. 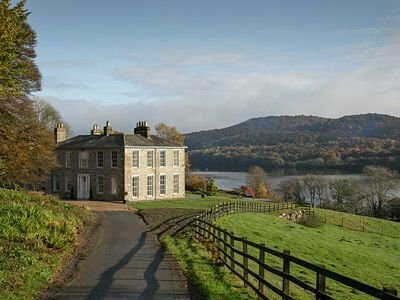 You'll find Silverholme on the shores of Lake Windermere, and what an impressive sight it is. The photo on the right shows you what to expect as you first approach Silverholme. Once you get to Silverholme you have an unsurpassed holiday accommodation to spend a few days. First of all, there are those 9 bedrooms; 5 double bedrooms and 4 twin bedrooms. Then you've got a large drawing room which also has an open fire. The library has a TV - and also has an open fire. If a winter short break is something you're after, you've got plenty of open fires to stay snug and cosy. And the well equipped kitchen has wall-to-wall sliding doors out onto the patio. Heating is provided by biomass central heating; there's plenty of TVs and a DVD here; to help with those domestic jobs, there is a washing machine, tumble dryer and two dish washers - should you be staying for a week or more, you also get a cleaner to come in and sort things out for you. Silverholme has Wi-Fi too. The large gardens open up onto Lake Windermere, so you take a seat on the terrace and drink in those fabulous views! You even get use of the indoor swimming pool at Graythwaite Farm during your stay at Silverholme. You may well want to stay in the grounds of Silverholme during your holiday; just relax in the gardens, sit in front of the fire, or go for a dip in the pool - but should you want to head off and explore the area, you'll find Windermere is only 5 miles away, and the base for many of the water sports available of Silverholme. Or you can sample the delights of the restaurant and pubs in some of the surrounding towns and villages - Coniston, Ambleside, Kendal and Ulverston are all within a few miles drive of Silverholme. The nearest pub is 4 miles away; and the nearest shop is 1½ miles away. And , of course, you can go out and explore the Lake District National Park - there is so much to see in the area, you'll have a fantastic time here. If you fancy a weekend or midweek break at Silverholme, you'll be pleased to hear that short breaks are available all year.